Editor’s Note: During this season’s Flurry of Fun at Walt Disney World’s Disney’s Hollywood Studios, the Jingle Bell, Jingle BAM! 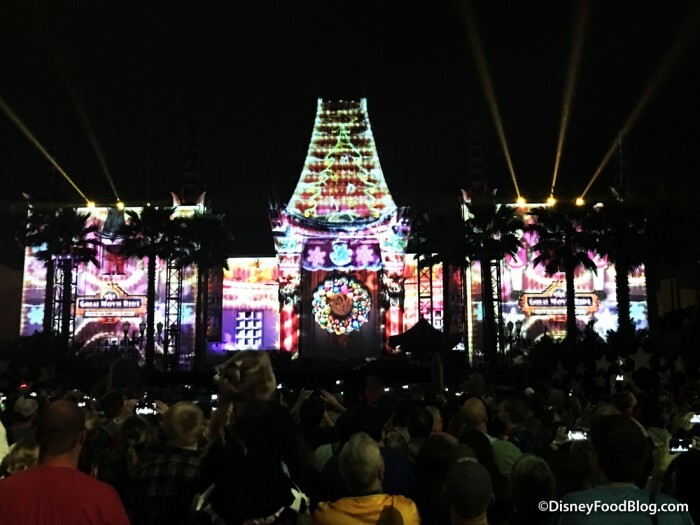 nighttime spectacular lights up the skies with festive fireworks set to holiday music and projections. 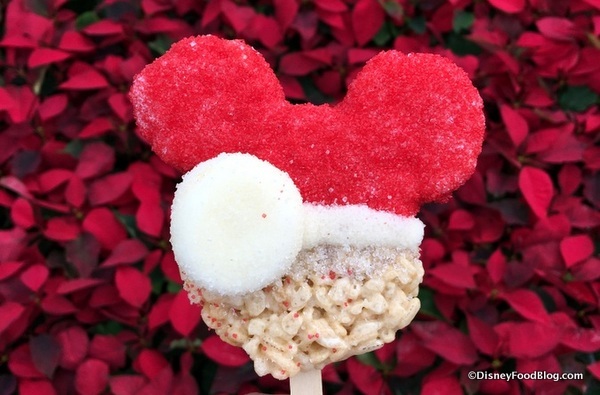 But how does it stand up to Magic Kingdom’s holiday dessert party? Guest author, DFB Reader Mark Roberts, chimes in with a helpful review. First, it is important to know that everything is being evaluated in light of the dessert party at the Tomorrowland Terrace during Mickey’s Very Merry Christmas Party that we attended the night before. 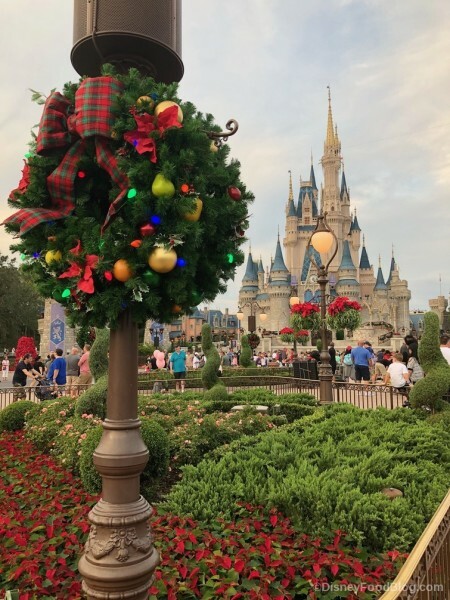 The holiday version of Wishes is simply stunning and everything about that dessert party was equal to the fireworks show. We had a fabulous time. 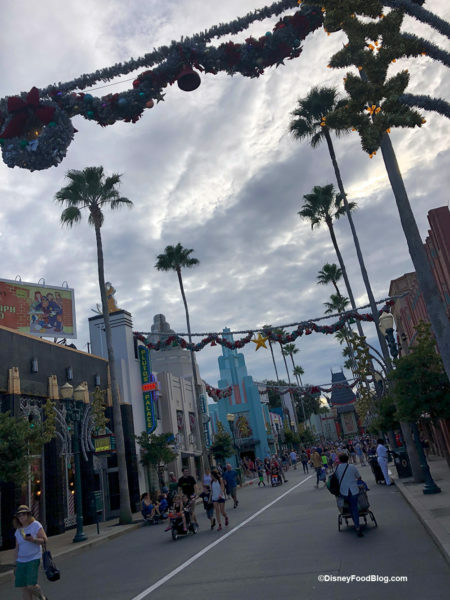 Unfortunately, Jingle Bell, Jingle Bam! doesn’t measure up to its cousin over in the Magic Kingdom. For starters, the Bam! dessert party is hurried. We were supposed to check in at 7:30 p.m. for the 8:30 p.m. show. Over in MK you can be a little late and not worry about it because you eat on the Terrace and watch (in a nice chair – remember that – it’s important later) the fireworks from the Terrace. If you are late, that just means less time to grab some food before the show starts. 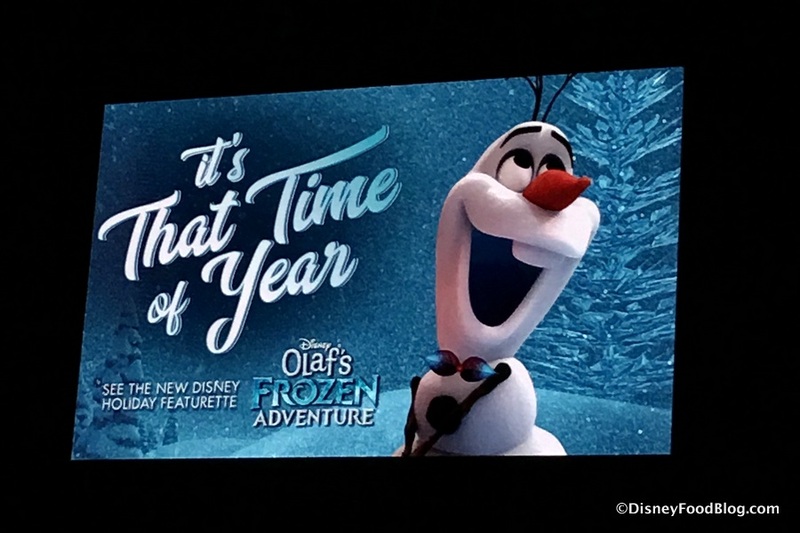 Not so over in Disney’s Hollywood Studios. 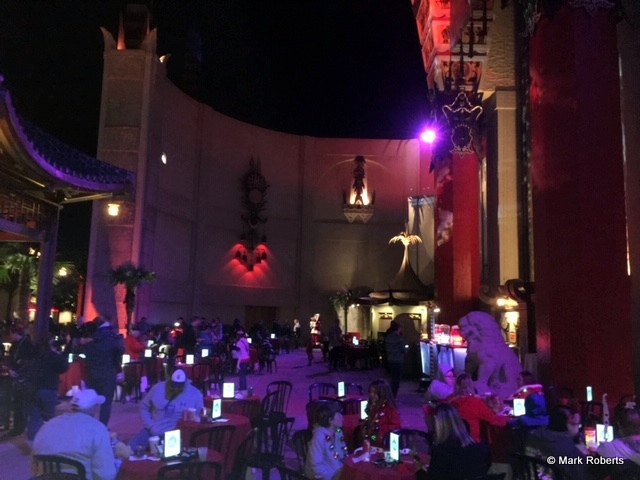 We arrived about 7:35 p.m. in the front alcove area of Grauman’s Chinese Theater (right where the entrance to the Great Movie Ride was). It was roped off and there were tables and a dessert buffet set up. But as soon as we were checked in and given a credential we were told that at 8:00 p.m. we would have to move because we were in a fireworks landing zone! That gave the evening a rushed feel, because — well — we were rushed! It’s Halloween in Magic Kingdom! We were LIVE at the first Mickey’s Not-So-Scary Halloween Party! Check out the Mickey’s Not-So-Scary Halloween Party merchandise! New dining experience for Tables in Wonderland members at Disney’s Contemporary Resort. Chef Art Smith’s Homecomin’ Rise ‘n Shine Brunch now available on Saturday and Sunday. We have details on the return of the D23 Sip & Stroll event at the Epcot Food and Wine Festival! 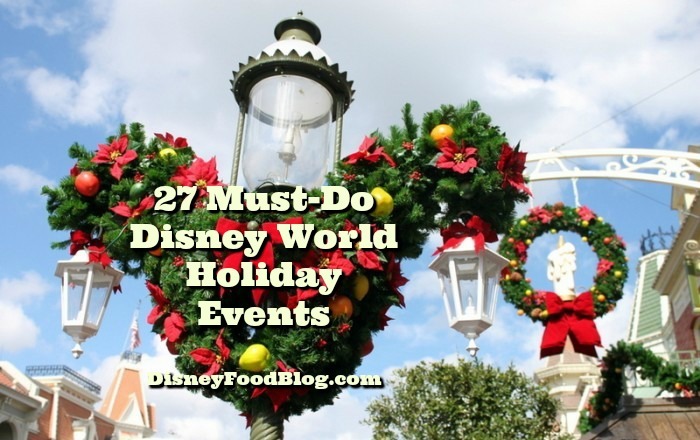 Check out the details on the Disney Du Jour Dance Party and more at the Epcot Food and Wine Festival. You have to check out the new Brownie Temptation at the Magic Kingdom! Mobile Order expands to Disney’s Caribbean Beach Resort! 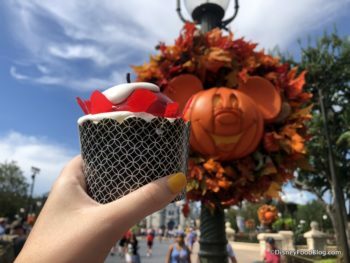 Check out all Halloween eats and party-exclusive eats at Disney World. Booking is now open for the Jingle Bell, Jingle BAM! Holiday Dessert Party! We shared dining updates for Disney’s Caribbean Beach Resort! We found a new healthy snack at Disney’s Yacht and Beach Club Resorts! Check out the DFB’s Epcot Food and Wine Festival map! A breakfast buffet is now available at the Ale & Compass Restaurant in Disney’s Yacht Club Resort. Halloween is ON at Disney World! Check out the Mermaid Donut that is coming soon to Disney World. We reviewed the Cheetos Hot Dog at Casey’s Corner in the Magic Kingdom. Check out the Rivers of Light Dessert Party review from Disney’s Animal Kingdom! You can get Mickey Jell-o in Disneyland! New DFB YouTube videos: Where in Disney World Can I Find…?, Food Tour of The Landing in Disney Springs, Part 2, Mickey’s Not-So-Scary Halloween Party Review, and 2018 Epcot Food and Wine Festival Preview. 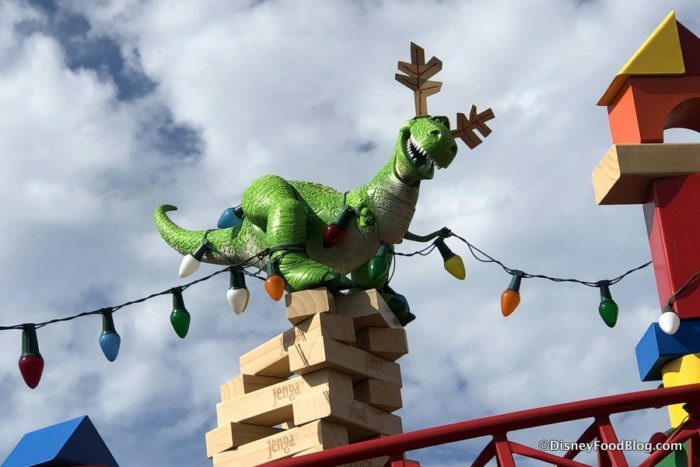 The Jingle Bell, Jingle BAM! Nighttime Spectacular is returning to Hollywood Studios in November for the holiday season, as part of the park’s festive Flurry of Fun! Along with this festive projection and fireworks show comes the return once more of the Jingle Bell, Jingle BAM! Holiday Dessert Party, pairing a reserved viewing area for the spectacular with holiday-themed food and beverages. 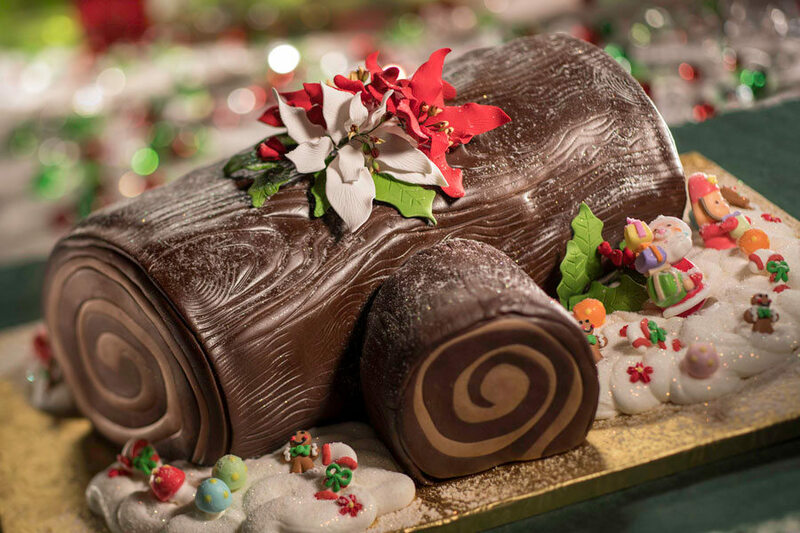 Food stations will offer holiday sweets and snacks such as warm cheese fondue with pretzel bread, and classic Yule Logs. 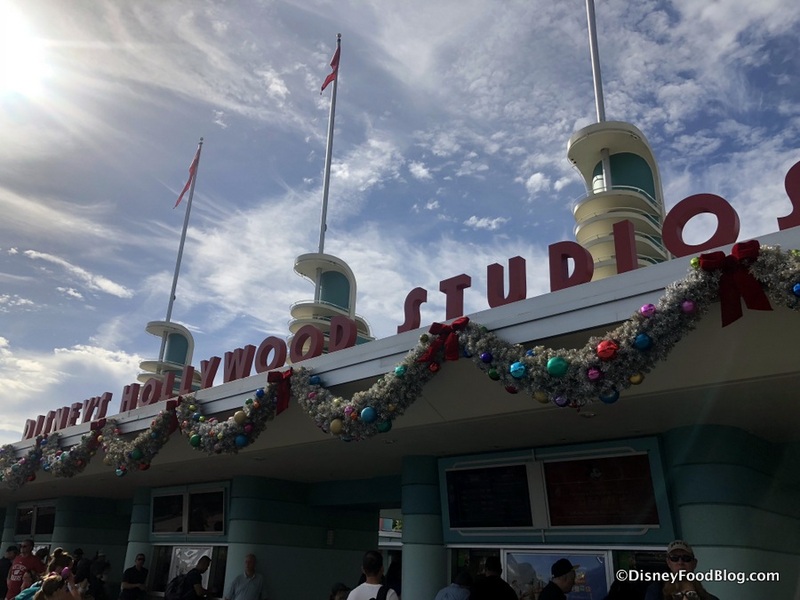 Filed Under: disney parks, disney's hollywood studios, Featured, News Tagged With: disney world holidays, Disney's Hollywood Studios, Flurry of Fun, Hollywood Studios Flurry of Fun, Jingle BAM! 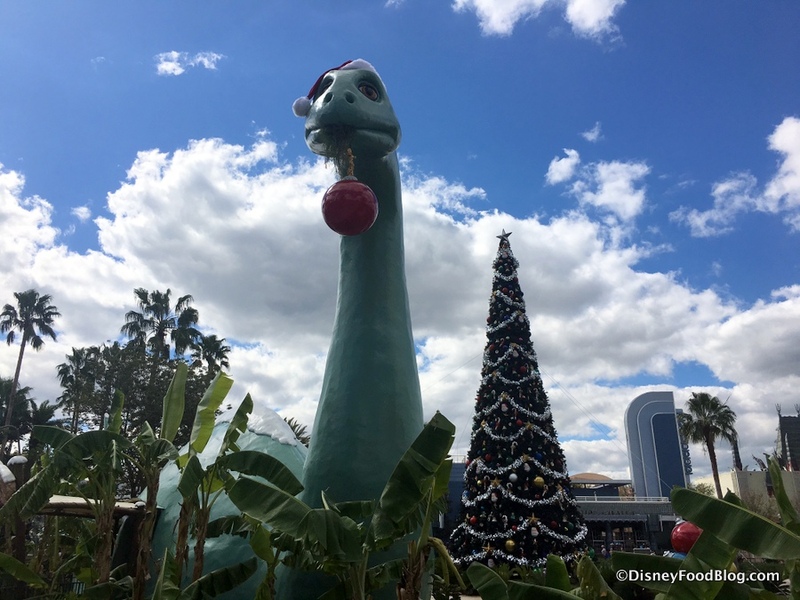 Holiday Dessert Party, Jingle Bell, Jingle Bell Jingle BAM!